Peru has a long and rich history. The first inhabitants of Peru were nomadic hunter-gatherers who lived in caves in Peru's coastal regions. The oldest site, Pikimachay cave, dates from 12,000 BC. Crops such as cotton, beans, squash and pepper chillis were planted around 4000 BC; later, advanced cultures such as the Chavín introduced weaving, agriculture and religion to the country. Around 300 BC, the Chavín inexplicably disappeared, but over the centuries several other cultures - including the Salinar, Nazca, Paracas Necropolis and Wari (Huari) - became locally important. By the early 15th century, the Inca empire had control of much of the area, even extending its influence into Colombia and Chile. The most startling feature of the great Inca empire was its brevity. 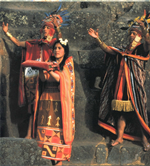 In 1430, the realm of the Inca consisted of little more than the river valley around Cuzco. Less than a century later, through conquest and a canny policy of incorporating the best features of the societies they subjugated, the Incas controlled a vast territory of almost 1 million square kilometers--a dominion that extended from northwest Argentina to southern Colombia. The Incan capital, at Qosqo, was undoubtedly the richest city in all of the Americas, with temples literally sheathed in heavy gold plate. Although Qosqo's architecture remains only in fragments and foundations, the architectural accomplishment of the Inca's has survived intact at the astounding ceremonial centre of Machu Picchu. Between 1526-28, the Spanish conquistador Francisco Pizarro explored Peru's coastal regions and, drawn by the riches of the Inca empire, returned to Spain to raise money and recruit men for another expedition to the country. Return he did, marching into Cajamarca, in northern Peru, before capturing, ransoming and executing the Inca emperor Atahualpa in 1533. Pizarro subsequently founded the city of Lima in 1535 but was assassinated six years later. The rebellion of the last Inca leader, Manco Inca, ended ingloriously with his beheading in 1572. The next 200 years proved peaceful, with Lima becoming the major political, social and commercial center of the Andean nations. However, the exploitation of Indians by their colonial masters led to an uprising in 1780 under the self-styled Inca Tupac Amaru II. The discontent among people against the Spanish rule in Peru started in the first quarter of the 19th century. An uprising by local European inhabitants against the Spanish colonial rule in 1821 provided an opportunity to Peru to declare its independence from Spain. Spain made several futile attempts to regain its rule in Peru, but finally recognized its independence in 1879. The same year Peru and Bolivia went on a four-year war with Chile over territorial disputes, resulting into defeat of Peru. During the 20th century, Peru settled its boundary disputes with neighbors, like with Chile in 1929, with Colombia in 1932, and with Ecuador in 1942. Today, Peru is a liberal democratic country in South America. Peru has a rich cultural heritage dating back to thousands of years, was shaped by the relationship between Hispanic and Amerindian cultures. Peru has passed through various intellectual stages--from colonial Hispanic culture to European Romanticism after independence. The early 20th century brought "indigenismo," expressed in a new awareness of Indian culture. Since World War II, Peruvian writers, artists, and intellectuals have participated in worldwide intellectual and artistic movements, drawing especially on U.S. and European trends. The main religion in the Peru Republic is Roman Catholicism, though the Indians, while outwardly Catholic, often blend Catholicism with traditional beliefs. Spanish is the main language. In the highlands, most Indians are bilingual, but speak Quechua as their mother tongue. There are about 70 other languages, and in remote parts of the Amazon, Spanish is rarely spoken. English is understood in major hotels and airline offices.